The incident happened around 5pm this evening. A section of the R523 near Listowel, Kerry. GARDAI HAVE APPEALED for information after a man in his 50s died in a crash near Listowel in Kerry. The incident happened on the R523 at Shanacool Cross, Listowel this evening at around 5pm. A man in his 50s died when his motorbike was involved in a crash with a car. He was pronounced dead at the scene and his body was removed to University Hospital Kerry in Tralee. A garda spokesman said: “This stretch of road is currently closed to facilitate an examination by Garda Forensic Collision Investigators and local diversions are in place. The road is expected to remain closed overnight. 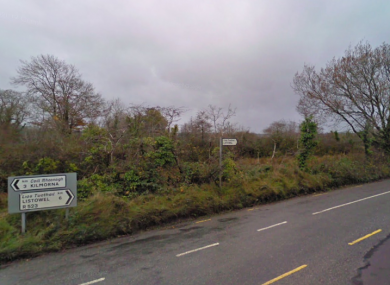 “Gardai wish to appeal for witnesses who were travelling along the R523 – Listowel to Athea Road at Shanacool Cross, between 4.45pm and 5.15pm this evening to contact Listowel Garda Station on 068 50820, the Garda Confidential Telephone Line 1800 666 111 or any garda station. Email “Man in his 50s dies in motorbike crash in Kerry”. Feedback on “Man in his 50s dies in motorbike crash in Kerry”.